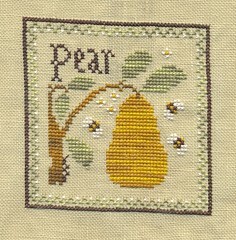 Nicole's Needlework: Pear is finished! Wow! I actually finished something! Matthew seems to take long morning naps and that's when I got Pear finished up today. Sorry the scan is crooked, I just cannot scan straight! Bradley, my six year old, made it through his first week of school. So we are gradually settling in. I miss Georgia a lot though. More than I thought I would. But Florida is nice too... hot, but nice. :) I'm going to go to Lasting Impressions tomorrow. It's a very nice cross stitch shop in Dunedin. I can't wait! :) Well, not much else...write more later! Congratulations on your finish! I don't know how you do it all. You really are super Mom! How exciting to have a needlework store nearby. I finished my Pear into a pinkeep - check out my blog for a picture. Take care. Congrats on the finish! It is so pretty. They picked a great color for the pear. Congrats on your Pear finish - it looks great! Oh, it's beautiful. I love these patterns stitched up, they look so much better than the computer image they use for the picture. Awesome job! Ann.